Pressure Range 10 to 150kg/cm temp. 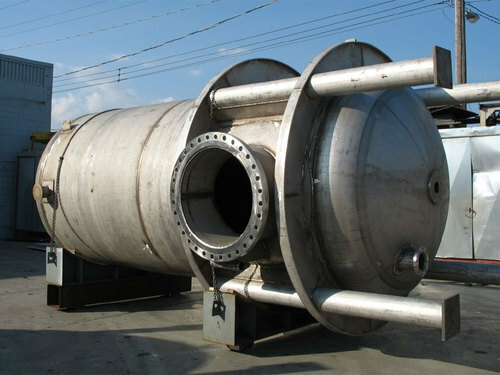 We offer a wide range of Reactor Vessel that are complete with different accessories. Tubular stands can be offered with clamps for the vessels, stirrers and other apparatus. The interior and jacket of the vessel are manufactured in line to ensure that the flow circulation of the heating fluid in the jacket is unvarying. The stainless steel seals with three holding segments, provide the equal allotment of pressure, for efficient sealing. B.A. Engineering, is a proprietorship firm established in the year 2001, as a Manufacturer, Exporter, Retailer and Supplier of Industrial Processing Machines. Our company has earned a reputable position in the market due to unmatched qualitative products imbibed with customer centric way of working. We are well equipped with sophisticated manufacturing facilities, which enable us to fabricate corrosion resistant machines that successfully meet up the qualitative and quantitative requirements of our client's. We guarantee our success by performing quality tests on products, before they are dispatched to our customers spread across the globe. We are offering Industrial Filter, Industrial Filter Machine, Vacuum Industrial Filter, Centrifuge Hydro Extractor, Micro Pulverizer etc to our clients.